A team of 80 archaeologists have spent more than 15 months working on the site and traced how the communities and landscape around Heathrow has changed. The project was the largest single archaeological dig in the UK in terms of the area excavated and the numbers of archaeologists employed. Evidence showed that the first permanent settlement was in the Bronze Age (2,400BC to 700BC). By the Iron Age (700BC to 43AD) a small village had appeared but that settlement died out at the end of the Roman era. Another one grew up in the 12th Century. Experts also found evidence that field boundaries were being created from about 2,000BC, 500 years earlier than previously thought. Tony Trueman of Framework Archaeology, formed especially to carry out the dig, said this was highly significant. "It shows that people were actually claiming ownership of land for the first time. "Before this land was shared by the whole of a community, but this shows us social attitudes were changing and hierarchies were emerging much earlier than we first thought." 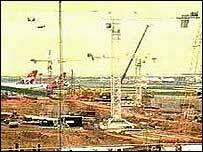 Heathrow Airport was built on the site of what had previously been a private airfield on Hounslow Heath in 1946. The £2.5bn Terminal 5 project is likely to be operational in 2007. Objects from the dig are already being displayed at the Museum of London and others will be exhibited at the Heathrow Visitors' Centre later this year.